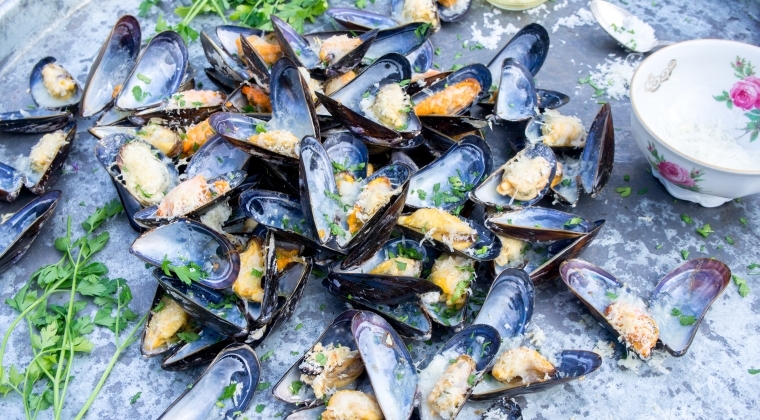 A large bowl full of mussels, covered by a layer of melted Parmesan cheese and fresh lemon dressing. Open a bottle of cool white wine or Prosecco and enjoy. This makes for a delicious dinner; although these mussels au gratin are also tasty appetizers. Pre-heat the oven to 180 degrees. Rinse the mussels generously with cold water. Broken mussels, or open mussels that remain open even after lightly tapping the shell have to be discarded. Add the mussels to a large pan. Bring to a boil and cover the pan with a lid. 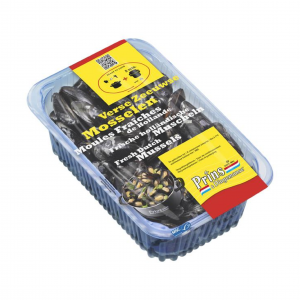 No need to add water, since you are cooking the mussels in their own moisture. Let the mussels boil over a high heat for a few minutes until all shells are open. Shake once to make sure that the mussels down in the pan open as well. In the meantime, prepare the lemon dressing. Mix the garlic with the lemon juice, a good dash of olive oil, some pepper and salt. Leave the mussels to cool off briefly. Remove the shells from the pan, open them all the way, and place them on the baking tray. Using a small brush, cover all mussels with some lemon dressing. Cover it all with some Parmesan cheese and some breadcrumbs. Place in the oven for 5 minutes or until the cheese has melted. Decorate with finely chopped parsley.